Products can have sets of Options, like Mounting, Hanging Options etc. Orders are downloaded from S3 by using any S3 compatible client, we recommend CloudBerry Explorer. Minimum fee is $500 a year, and includes up to 3,000 orders and or 30,000 images (per year). Excess orders are billed at $.10 per order, excess images are billed at $.01 per image. Excess image and order fees are assessed quarterly or annually based on volume. There is no percent of sales taken. Price does not include AWS S3 fees which will vary depending on the amount of data transfer and data storage, but generally should not be more than a couple dollars per month for most users. S3 storage is around $.03 per GB/month, and transfer is about $.09 per GB/month. See AWS S3 Pricing for more info. Take it for a spin and upload orders to our Demo site! Press Printed Cards - 5x7 Flat is a great example with lots of options and quantity based prices. Interested in using the Simple Order System? send us an email and we will send you a link where you can sign up for a 30 day trial. My name is Ron, and I own a photo lab in San Diego called ProLabPrints.com aka Fromex Photo. I built the SOS because I wanted a simple, quick and inexpensive way for my customers to order online. While we also have another full featured system, and encourage people to use it, it is more complex and takes more time to build an order if you already have files that are ready to print (this is where the SOS shines). It also works on phones and tablets and is very simple to use. While it doesn't show cropping, it seems that many people don't understand how to do that anyways so why not skip it altogether. I did not build this system to be the best system available, more of something that fills a particular niche, and does so at a minimum cost, which in my lab it does perfectly. Please note that while this system is reliable and easy to maintain, it is not 100% perfect and can fail for a variety of reasons. All images are kept in YOUR S3 account, if you delete them they cannot be recovered. We do not keep any order info other than some metrics - order #, last name, # of images and date. If you loose the email or the POS report there is no way to recover the order info. 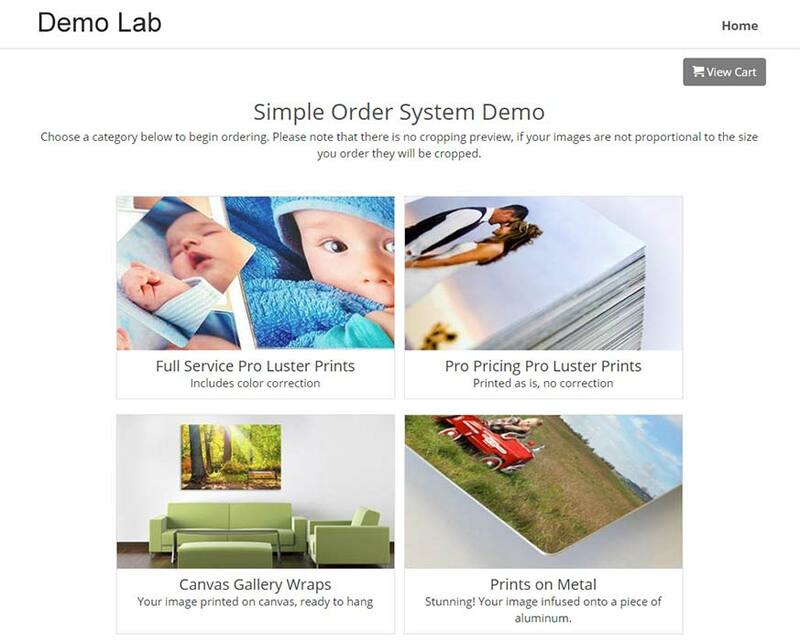 A simple web based ordering system for Photo Labs and Printers.